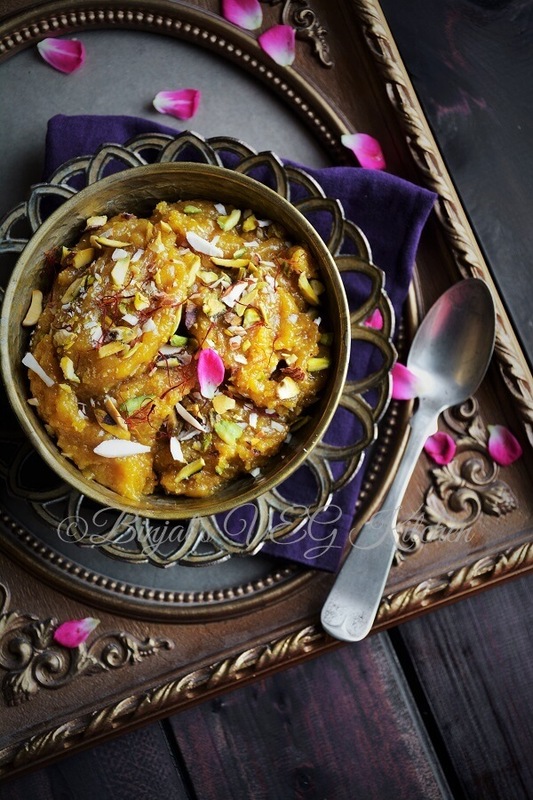 Besan Halwa is one of the most popular dessert from North Indian cuisine. Besan Halwa is made from besan/gram flour/chickpeas flour. 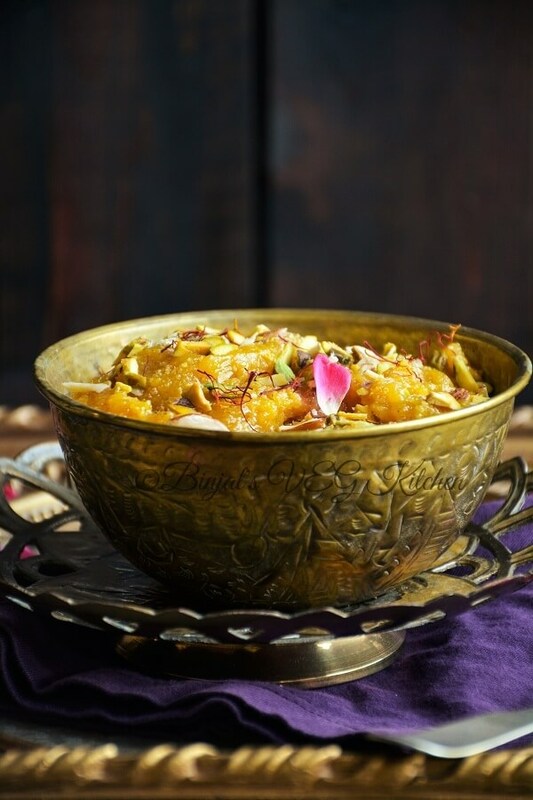 Besan Halwa is very rich and delicious in taste, and especially very popular in festivals and functions. This is very easy to prepare with very less ingredients. Actually Besan Halwa is just a loose term for a variety of sweets from the Middle East and South Asia regions. Besan Halwa can be nut or flour based. 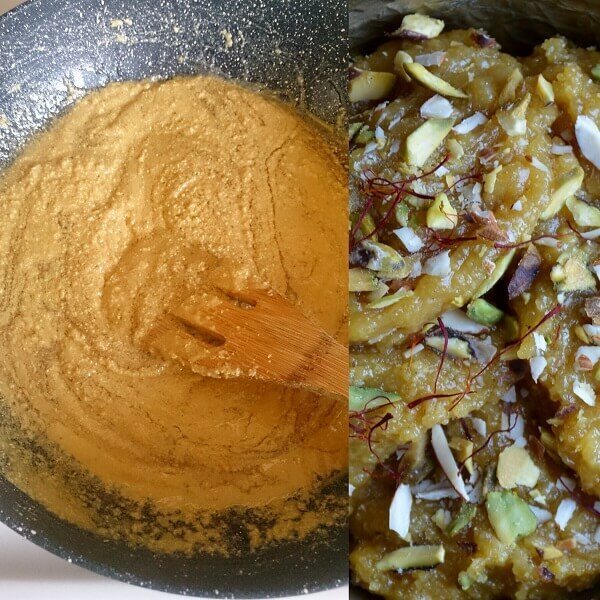 If you like the flavor of besan/gram flour/chickpeas in sweets then you will love this Halwa. Your kids may gobble it up even before Besan Halwa has a chance to cool down. 1. In a deep bottom pan/kadhai, add besan, ghee, and roast it on low flame till all raw smell goes out and besan changes the color slightly brown. 2. While roasting beasn, at the same time take a sauce pan, add sugar, ½ cup water, saffron thread, and cook it on low flame and bring it to boiling point, then boil it for 2-3 minutes. 3. Add prepared sugar syrup in the roasted besan mixture and mix it well then add milk, cardamom powder and raisin. 4. Mix well, stir it continuously till the mixture becomes thick, let separate the little bit ghee from the mixture. 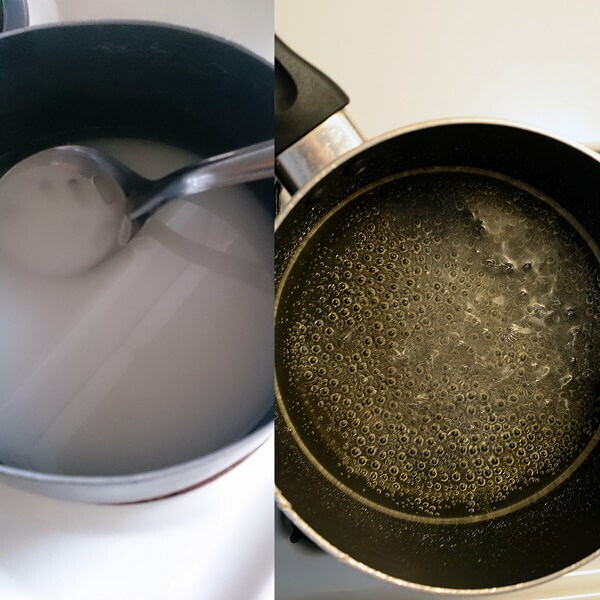 Eventually your mixture will be no-sticky. 5. 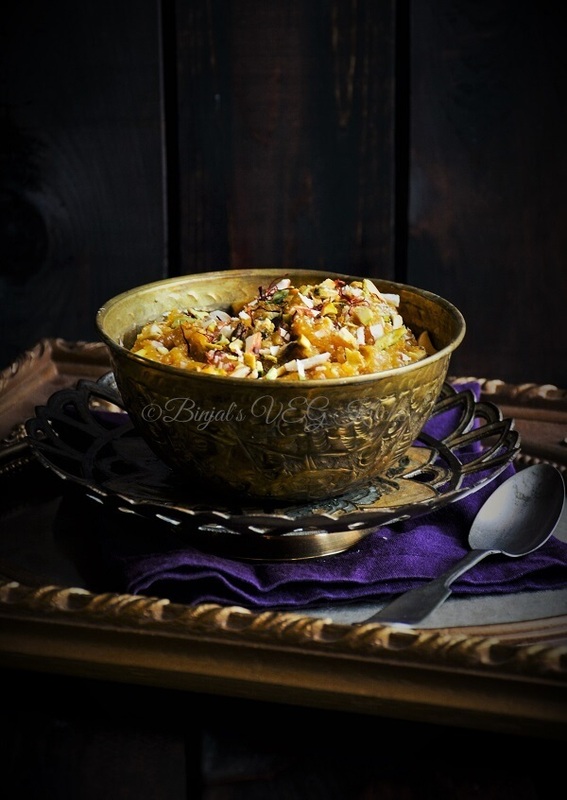 Besan Halwa is ready, garnish it with chopped dry fruits and serve it hot or cold. • If you are using fine variety of besan then add 1-2 tbsp Suji in besan. • Use laddu besan for best result. • You can store this Halwa for 1-2 week in a refrigerator. • Whenever you want to eat stored halwa, add little milk in it, mix well and then cook it on low flame for few minutes. • Even you can reheat stored halwa in a microwave for 1 minutes before eating. In a deep bottom pan/kadhai, add besan, ghee, and roast it on low flame till all raw smell goes out and besan changes the color slightly brown. While roasting beasn, at the same time take a sauce pan, add sugar, ½ cup water, saffron thread, and cook it on low flame and bring it to boiling point, then boil it for 2-3 minutes. Add prepared sugar syrup in the roasted besan mixture and mix it well then add milk, cardamom powder and raisin. 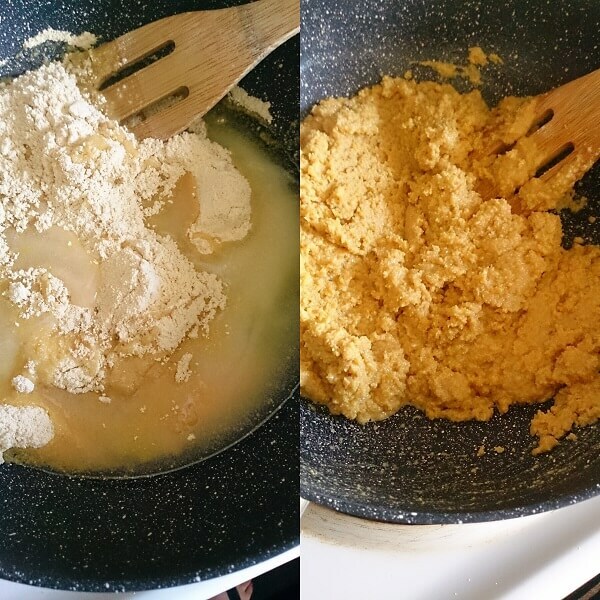 Mix well, stir it continuously till the mixture becomes thick, let separate the little bit ghee from the mixture. Eventually your mixture will be no-sticky. 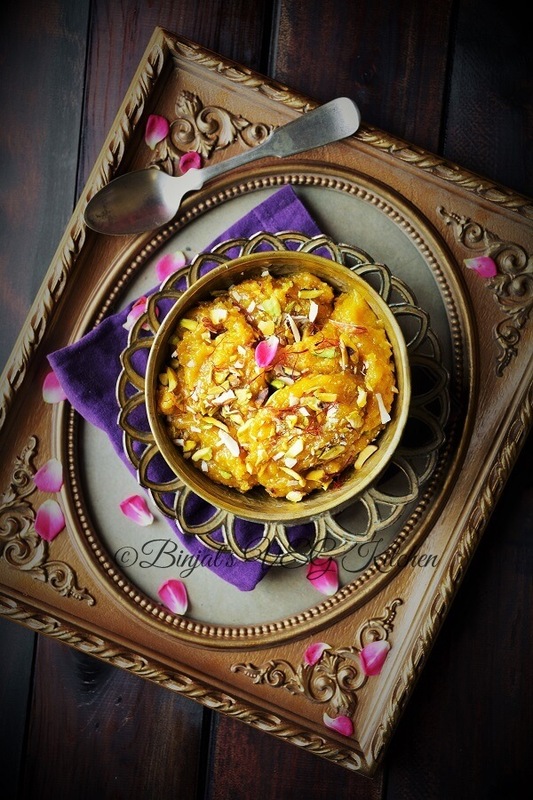 Besan Halwa is ready, garnish it with chopped dry fruits and serve it hot or cold. this is absolutely a must try, thanks! I always buy my halwa, but you make it seems so easy to make. I can’t wait to try! I’m loving the sound of this and it looks delicious. A must try. These look so delicious! I love your photos! Its easy, awesome and attractive. Thanks!